Writing a resume is often seen as a extensive, time-consuming process that takes a lot of work, but when you are looking for a new job, it’s more than worth the effort. A resume is that piece of paper which defines everything about your work and achievements. It is what helps you make an impression and land that dream job. With more and more graduates entering the job market every year, recruiters may receive thousands of resumes just for one position. That means a recruiter has less time than ever to size candidates when scanning resumes. In fact, it’s a matter of a mere seconds before they flip onto the next resume. Wait, there’s more! About 80% of the resumes sent to a single recruiter do not make it to the first cut. If there is one sure way to make your way through, it is by tailoring your resume for every job you are applying for. Further, you should pay special attention towards the format, making the bullets action-oriented and making sure that your achievements are properly highlighted. This way you can ensure that you are a cut above the rest. Need help on how to do just that? To make your resume stronger against rejection, we have come up with a list of 11 points to craft the perfect work resume. Make your resume easily scannable. A clustered or badly formatted resume will just make the recruiter skip important parts and leave a bad impression. Make sure to leave some white space to break up the information. Stick to a one-page resume and use sections, subsections and text formats, such as bold and italics, to draw attention to important information which you want them to know. 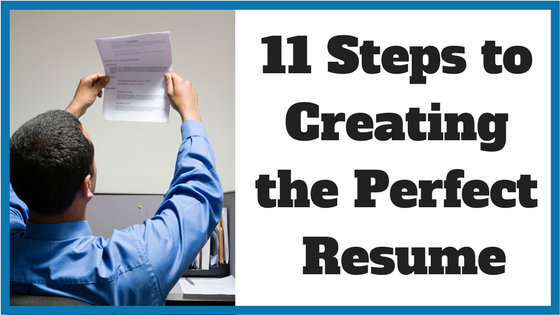 This will also help recruiters get the most out of your resume easily and quickly. Typography is another major element which needs to be taken care of. It adds on to the personality of the resume. Using fancy counts could be a costly affair and with innumerable fonts to choose from, picking the right font can be tough. To make it easier, there are already some proven fonts which has a long history of being successful. Calibri, Arial, Garamond, Verdana Trebuchet MS, Georgia, and Book Antiqua are some fonts which have personality, style and professionalism – all of which can impact a hiring manager’s impression of you. After scanning through your resume, if the recruiter wants to contact you, it should be easy for him to get the info. So, use the header section to mention your name and contact information. You can mention email, phone number and address. Apart from that, you can also mention LinkedIn too. You can also use the footer section for contact details, but it is better to keep it at the top, as this is more common. You’ve only got one page to show why you are eligible for the job. Not all the jobs you apply for will require all the skills you have gained from every job you’ve had since you were a teenage. Include only necessary, relevant skills and experience to keep it short and succinct. For example, if you’re applying for an system auditing position, you can drop the editorial internship you did at XYZ newspaper. Rather, point to prior work experience related to the role (such as software engineer, etc) and describe your work-related responsibilities in detail. Make every bullet point concise. It should be no longer than two lines, with no more than four or five points per job. Make it as easy to scan as possible. Before: As the Sr. Assistant manager in the Production Department of ABC organization, I was responsible for carrying out a study to optimize the production process and increase production efficiency by 12%. After: Optimized production process to increase overall efficiency by 12%. Use text format such as bold and italics to catch the attention of the recruiter. Quantify the work you have done; it’ s easier to understand how your work has added value to a company. Another way to weed out unnecessary points is to ask yourself, “So what?” It will help you understand what value you have created in the past. Before: Optimized production process to increase overall efficiency by 12%. Quite a number of companies use applicant tracking systems (ATS), which specifically looks for keywords. The more descriptive and accurate a word is in its nature, the easier it is for the recruiter to understand your nature. Use keywords such as organized, led, evaluated and designed, instead of “was, did and made” at the start of every bullet point. Before: Responsible for production and packaging of products. After: Optimized assembly line production by monitoring for production shortages and packaging. Your resume might not always be read by someone who knows all the technical jargons as you do, particularly if you are applying to a different industry. Your resume should be worded so it can be read and understood by all with ease. This could be challenging if your job is highly technical-oriented, which of course, will have to include terms not everyone is familiar with. But, by giving relevant context and lesser abbreviations, your resume more understandable. Irrespective of when you graduated, you should include your college/university degree(s) to your resume. If you are a recent graduate with limited work experience, you can highlight awards, achievements and any relevant experience you had in college or university, including internships. Example: Awarded Best Entrepreneurship Prize for building smart robot for ZY league competition in 2015. Keep your current job role at the top, followed by the job right before and so on, this makes sure all the relevant info is easily viewable. Again, if you are a recent college graduate with a short history of work experience, you may opt to focus on internships and apprenticeships completed while in school to convey your work ethic and job-related skills. Your extracurriculars convey what other sections might fail to cover. Qualities such as outgoing and team player can be displayed by mentioning activities. Also, if you have volunteered somewhere or have won awards, don’t fail to mention those too. A lot of companies favour employees who care about their community and/or are over achievers. If there is one thing that MUST be error-free in your the resume, it is your spelling and grammar. Your resume is the last place to have sloppy grammar and frequent spelling mistakes. One cannot afford to make even one mistake in this one-page document, which is supposed to help you create an impression in 15 seconds. Hence, it is extremely important to run your resume through spell-checkers, such as Grammarly. It’s also a good idea to have a few people you know proofread it. Making sure you have the right resume for the right job means more than just filling in your qualifications. It means selecting the right format and ensuring that you’re organizing all relevant information strategically. Having a good profile and strong experiences is not enough, you must also be able to showcase your skills in one page and convey why you must be chosen for the job. Want more tips? Check out this blog post on 23 tips to take your work resume to the next level. Thinking of hiring a career coach to help you brush up on your resume and get the job of your dreams? Browse our directory of career coaches and get a FREE consultation or request a personalized coach recommendation! Abhyank Srinet holds a Masters in Management degree from ESCP Europe & has an engineering degree with a specialization in Instrumentation & Control. His interest in the digital landscape motivated him to create an online start up for Masters in Management application consulting, focused on spreading quality information about the MiM degree & performing application consulting services for clients. He is the chief consultant of the company and takes care of Business Development and Digital Marketing side of the company.